Dana Ainsworth spent the summer as a fellow at the University of Oxford for an intensive graduate course in English Literature. For three weeks this summer, Ms. Ainsworth took up residence at Exeter College, exploring the stacks at the Bodleian Library, and taking seminars in Romantic Poetry and Modernist Fiction with Oxford professors. “I loved the opportunity to challenge myself and grow in such a rich learning environment! 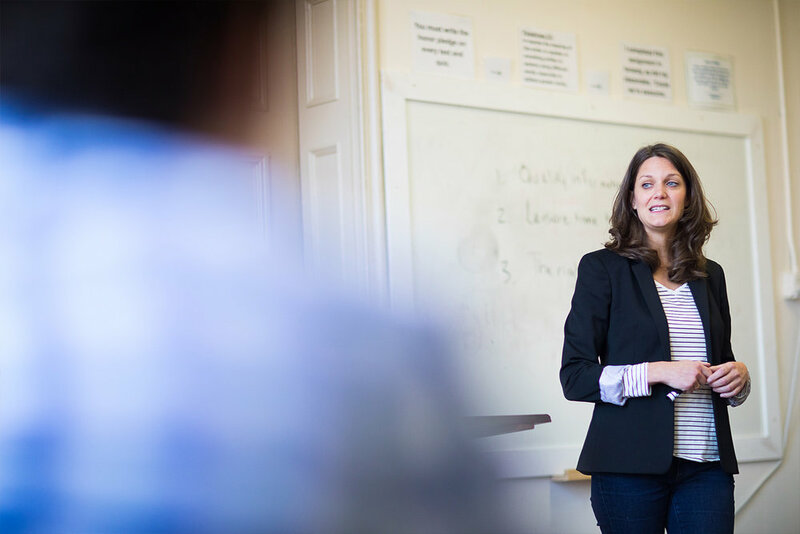 The conversations with my professors and fellow learners provided a wider perspective on literature and inspired me to think in entirely new ways,” commented Ms. Ainsworth. Ms. Ainsworth also won a fellowship that is offered in concert with the Oxford course: the Teachers Learning Abroad Scholarship, awarded by the Charlottesville Branch of the English-Speaking Union (the same folks who sponsor the National Shakespeare Competition). "Dana is an ambitious teacher who strives to connect her students to literature in memorable, meaningful ways. She strikes the ideal balance for a teacher of literature: she encourages her students to scrutinize details, but also to go for big-picture connections. For two years running, Dana has used her spring break to lead our students on learning-abroad programs. I'm thrilled that she got to go abroad on her own this summer, to continue her studies at Oxford, the epicenter of British literature! Dana is proof that great teachers never stop learning," commented Dr. Jason Nabi, Director of Academics.